Romano’s BBQ Meatlovers Pizza is about the size of a small dinner plate. But according to the package, it contains 8 servings. That’s about 50g per person. The serving sizes listed on food packages are supposed to reflect realistic portions. But like Romano’s pizza, some don’t. Serving sizes also fluctuate between products that should be comparable – 2 chocolate flavoured milks, for instance. The result is that you can’t rely on serving sizes to determine if one food is healthier than another or use them to estimate the kilojoules you’ll actually eat. And that’s a problem in a country where two-thirds of the adult population is overweight or obese. Since 2002, food manufacturers have had to provide consumers with nutritional information about products. This information appears in the nutrition information panel on food labels. In theory, you should be able to use per serving information to figure out a food’s nutritional value based on a reasonable portion size. However, the serving sizes listed on food labels aren’t defined by a regulatory authority. They’re determined by the manufacturer. As a result, serving sizes can be inconsistent across comparable products. They can also be unrealistically small. Tip: Use the per 100g or 100ml column in the nutrition information panel if you want to compare the nutritional value of different food products. Per serve information is useful if you’re looking at a single serve container (such as a pottle of yoghurt). In these instances, the per serve information gives you a better indication of the total energy and nutrients you’ll actually consume. Serving sizes form the basis of other nutritional information on food products. Percentage daily intake values, for example, often appear prominently on the front of food packages and in the nutrition information panel. These values are supposed to tell you the percentage of your daily energy needs – as well as other nutrients – in a single serving. But the percentages are misleading if the serving size is unrealistic. Moreover, you can’t use the percentage daily intake figures to compare two products – even if they’re made by the same brand – because the serving sizes they’re based on aren’t equal. Kellogg’s Just Right Original, for instance, contains 7 percent of your daily energy intake and 13 percent of your daily sugar intake in a 40g serving. That seems slightly worse than Kellogg’s Coco Pops (6 percent of your energy, 12 percent of your sugar) until you realise the percentages for Coco Pops are based on a 30g serving. In 2009, an expert panel was set up to review our food labelling laws. The panel’s final report, Labelling Logic, was published in 2011. It contains 61 recommendations, one of which is to make per serving information no longer mandatory unless the product contains a daily intake claim. However, the proposal to make per serving information voluntary won’t solve the issue of inconsistency. Consumers shopping for healthier groceries are already faced with dubious product claims (see “Food label claims”) and confusing nutrition information panels. Another food-labelling element that can be added or removed at the manufacturer’s whim won’t help. In December, Food Standards Australia New Zealand called for submissions on the proposal for voluntary per serving information. The consultation period closed in February. If a decision is made to keep this information, we think serving sizes need to be standarised and monitored. Some manufacturer-defined serving sizes – and other labelling elements that depend upon them – are unhelpful. We took a look at the serving sizes listed on some of the food labels at our local supermarket. 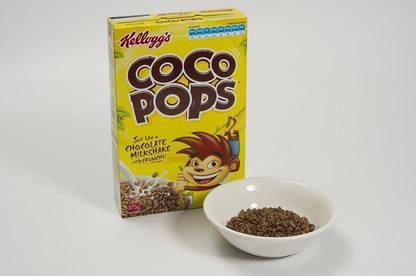 Kellogg’s Coco Pops is an example of a sugar-laden breakfast cereal: “Just like a chocolate milkshake … only crunchy.” The recommended daily intake panel on the front of the box is based on a 30g serving. That serving size leaves plenty of empty space in the bowl. Even though rolled oats are a basic product, the serving sizes can still vary significantly from brand to brand. 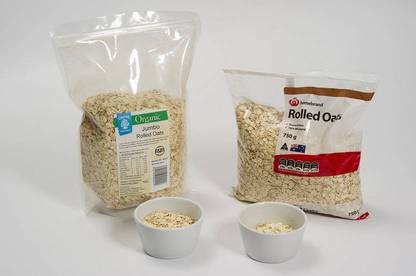 The serving size for Chantal Organics Jumbo Rolled Oats is 50g. That's 20g more than Homebrand Rolled Oats. 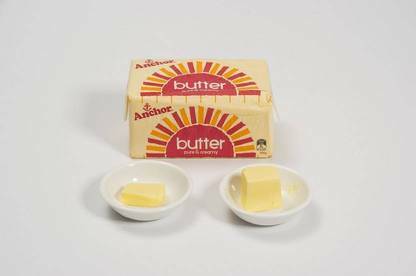 In New Zealand, Anchor can determine its own serving size for butter – 5g. But in the US, it has to base its serving size on an amount of butter “customarily consumed”. That’s about 15g according to the US Food and Drug Administration. 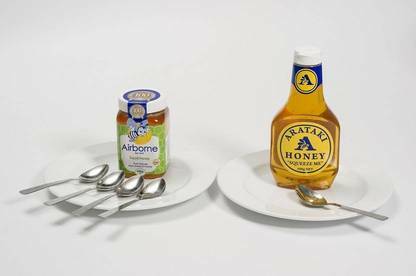 Both Arataki Honey “Squeeze Me” and Airborne Liquid Honey contain about 80 percent sugar. Airborne’s serving size (20g) is four-times greater than Arataki’s (5g). Bacon is the cornerstone of a cooked breakfast. However, the serving size can double depending on the brand. 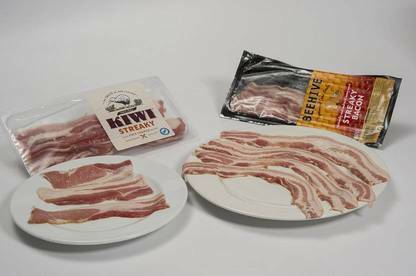 A pack of Kiwi Streaky Bacon lists 50g per serving whereas Beehive Streaky Bacon lists 100g per serving (four rashers). 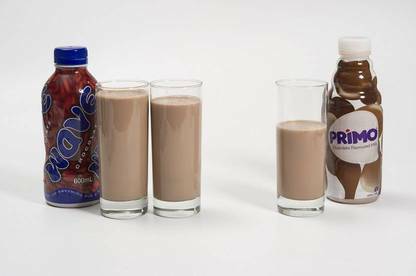 According to the label, a single serve of Primo chocolate milk is worth 6 percent of an average adult daily energy intake. But that figure is based on a 200ml serving. If you drink the entire bottle, you'll consume three times the amount of energy. Wave's daily intake figure (24 percent) is based on the entire 600ml bottle, which many drinks manufacturers consider to be a single serve. In the US, food manufacturers must list energy and nutrients per serving. The US Food and Drug Administration (FDA) monitors these serving sizes to ensure they’re based on how much food people actually eat. There are standardised serving sizes for 140 product categories – from “cookies” to “croutons”. Last year, the FDA proposed updating certain serving sizes. The original reference amounts were based on food consumption surveys done in the ‘70s and ‘80s. Americans now eat bigger serving sizes for some foods and smaller serving sizes for others. Among proposed changes are increasing the serving size for ice cream from half a cup to a cup and decreasing the serving size for yoghurt from 225g to 170g. The FDA realises increasing serving sizes for some foods may encourage people to eat more. It has stressed the increased sizes are not necessarily “recommended”. Rather, they’re based on what people actually eat for better or worse.